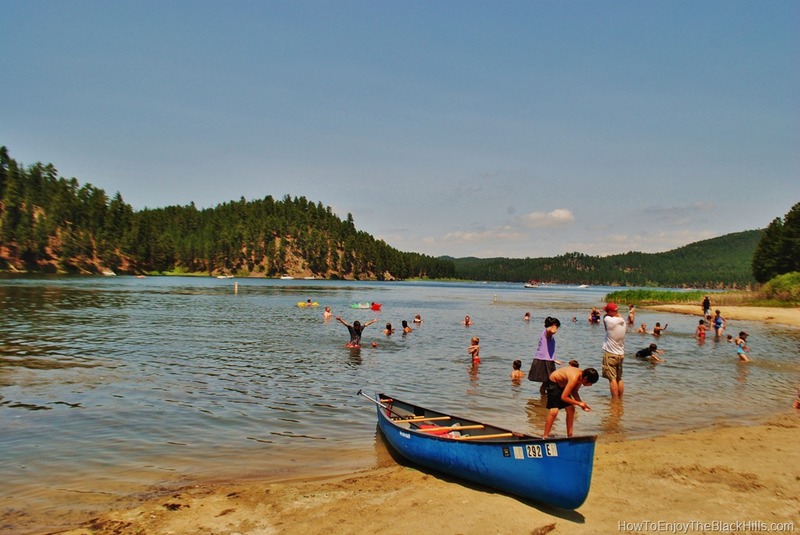 Sheridan Lake is located in the Black Hills National Forest of western South Dakota. The lake is just shy of 400 acres and offers many recreational possibilities. There are two swimming beaches, a marina, two campgrounds, plenty of fishing, picnic areas, hiking and more. The lake was created in 1939 as a recreational lake by the Civilian Conservation Corps. The lake is popular with anglers. In the past the lake was home to numerous Northern Pike, severely reducing the population of other fish. However, in recent years the pike population has been reduced. Now people report catching trout, northern pike, perch, bass and other pan fish. There are two boat ramps, one on the north side and one on the south side. Shore fishing is popular with several docks available. Plus, the lake is a popular ice fishing location. The south side is home to the largest Black Hills Nation Forest Campground with 129 camping Spots. Many of the camping spots have lake views and are very close to the boat ramp. This is a very popular campground as it is only 15 miles from Rapid City. The North Shore camping area has 5 group campsites available. There are restrooms and water at the campground. With two beaches and the proximity to towns, the lake is popular with swimmers. The North Swim Beach is the largest in the forest and is located by the marina. The South Beach is just of US Highway 385 and has several picnic areas nearby. There are also vault toilets near the beach. Use of the beaches does require a small day use fee. That fee helps maintain the area. There is plenty of hiking in the area. You can access both the Flume Trail and the Centennial Trail at the lake. Literally providing access to hundreds of miles of hiking trails. Visit the Sheridan Lake Complex site for complete information. Pick up Black Hills National Forest Map Pack: Topographic Trail Maps for help navigating the area’s roads and trails.